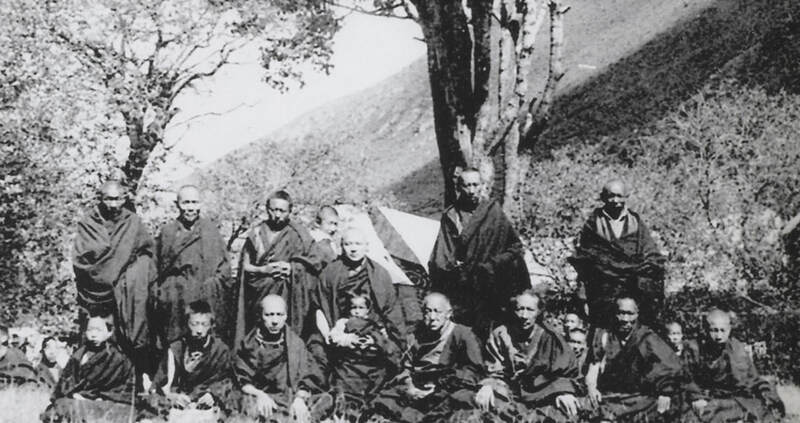 The 16th Gyalwa Karmapa with Situpa, Dilgo Khyentse Rinpoche and Sangye Nyenpa Rinpoche and other lamas near Tsurphu. Photographer unknown. In the summer of 1958 the cease-fire collapsed in Kham (between the Chinese occupiers and the Khampa-fighters) and fights broke out again. Soon 150,000 well-equipped Chinese soldiers fought against a wild and indomitable army of mounted Khampas. As result of the battles, which soon covered all of East Tibet, more and more refugees arrived in Central Tibet. Among them were lamas such as the 12th Situ Rinpoche, the 9th Sangye Nyenpa Rinpoche, the 3rd Beru Khyentse Rinpoche and many others. Despite the turbulent times and though he was fully aware that he would soon have to leave his country, the Karmapa in no way reduced his Dharma activity, which included new construction. In 1957 he constructed eight stupas in Tsurphu, where tulkus such as Dilgo Khyentse, Sangye Nyenpa, Palpung Atrül, Ongen Tulku and Togpa Rinpoche lent a hand, participating physically in the work. He also renovated Marpa’s Centre in Lhodrak. It appears that Karmapa wanted to show that one should never give up on doing positive things, no matter how difficult and desperate the situation seems to be. In July 1958 one of the rebel Khampas went to see Karmapa and asked him to compose a Guru Yoga from his enlightened mind stream which was “effective and short” for the new life circumstances. The Khampa explained that he was already too old to do more extensive practices and asked for a simple but complete practice to purify* the mistakes he had made. Yishin Norbu honored the request and wrote a Guru Yoga, which later became very famous among Kagyü practitioners in the West. Probably, no other Guru Yoga is practiced as much in the West as the meditation on the 16th Karmapa. (See: The 16th Karmapa’s instructions on the Guru Yoga in Volume 2). To repel the worst harm, Karmapa did Mahākāla and Vajra Kīlaya retreats and built three Mara repelling stupas. Even if they could not do much against the overall upcoming catastrophe, these activities protected people in many cases and later also facilitated his own flight. In the course of the year 1958, as the Dalai Lama later explained, “The situation in Kham became more tense, with increased aerial bombing and anti-religious propaganda.” As the conflicts progressively spread to Central Tibet, Yishin Norbu sent the Rinpoches Tai Situ, Sangye Nyenpa, and Jamgön Kongtrül into the safety of exile. He advised many others to leave as well. He warned Shechen Kongtrül Rinpoche to leave immediately, as otherwise it would be too late. However, Shechen Kongtrül felt the urgent need to visit the great Mindrölling monastery one last time and didn’t want to go straight away. Karmapa’s view of the future could not have been more precise. He prophesied to Shechen Rinpoche that he could “stay there no more than two weeks. Then you have to come straight back here and go on to Sikkim.” He said that otherwise Shechen Kongtrül would not be able to leave the country alive. The master was delayed on the way and failed to return on time. He was taken prisoner by Chinese soldiers and deported to China, where two years later he died in imprisonment. © From: Gerd Bausch: Radiant Compassion. The Life of the 16th Gyalwa Karmapa, www.edition-karuna.de. Please feel free to share the extract, but give the source. Many thanks! Dalai Lama: Freedom in Exile, op. cit., p. 137. Watzlawek, Stefan & Zaremba, Melanie: The Meditation on the 16th Karmapa. An Interview with Lama Ole Nydahl, Buddhism Today, #20, Fall-Winter 2007. Jigme Rinpoche: The Guru Yoga on the 16th Karmapa, course in Dhagpo Kagyü Ling, August 2015. Regarding the date of origin, there are conflicting statements. The practice text itself gives 1958 as the date. Khenpo Karthar Rinpoche: Lives of the Karmapas, CD 5/5, op. cit. Jawaharlal Nehru Memorial Fund (Edit. ): Selected Works of Jawaharlal Nehru (Part II - Volume 48, April 1- 30, 1959). Tulku Urgyen Rinpoche: Blazing Splendor, op. cit., p. 309. Douglas/White: Black Hat Lama, op. cit., p.117.